As the Oil & Gas industries begin to recover from their prolonged slump, the need to increase production by manufacturing facilities will begin to ramp up quickly. It is crucial for companies that have had reductions in staff to work with a manufacturer of cold roll tooling that not only meets the highest available quality and safety standards available, but has the proven success in industry. Having the best possible equipment minimizes the risk of failure from day one, and allows workers to focus on doing their jobs right. It can be very time consuming training new operators how to use the best machining practices. Therefore, our risk management approach was to design a tool that is both safe and easy to use. Unlike other cold roll products, CJWinter’s self-contained hydraulic tools do not require any external power source to preload the pressures, by eliminating all their worries that hoses get caught up in rotating spindles. CJWinter is the only manufacturer of cold roll tooling in the world that has earned the coveted NS-1 Accreditation for the process of cold root rolling rotary shouldered connections. This assessment and training based certification helps to assure competence and quality in operations for the oil and gas industry. Safety and prevention of equipment failures, especially considering the harsh requirements of drilling environments, is our number one objective. Many professionals choose equipment manufactured by Fearnley Procter NS-1 Accredited companies to ensure that the tools they use in the field are properly equipped for the intense demands of extreme drilling environments designed with safety in mind. Risk management is our highest priority. 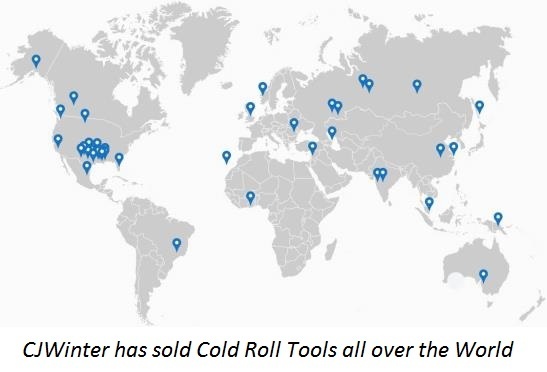 Having sold hundreds of tools in just a few years, CJWinter’s cold root rolling tools are “SUPERIOR” than our competitors, our customers experience proves it! To learn more about CJWinter’s Cold Rolling Products, visit www.coldrootrolling.com.